The other day, on my way to a lecture I came across an interesting sight. A sight that made me feel like I was in a movie or at least a movie set. It made me realize where I was and where I came from and what an odd scene this would have been back in Istanbul! 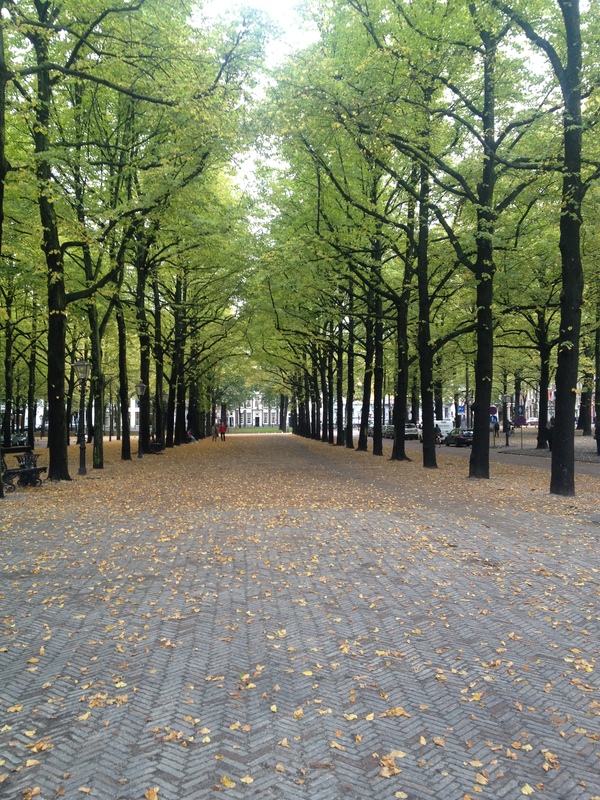 I thought to myself: “Oh well, just a normal day in The Hague…” and couldn’t help but smile at the whole situation. This early morning surprise is what gave me the idea to write about a day in the life of me, a Leidener in The Hague. 09.00 am. Communicating Power lecture. To be honest sometimes 9am lectures might be hard to show up to, especially if there was a party the night before or if you just spent your time in front of the computer doing nothing all night. But the good thing about them is that you have the rest of the day to yourself! To my luck the lecturer finished 15 minutes early and since we skipped the break that added 15 more minutes. 15+15=30 minutes! Being out half an hour earlier than usual, I decided to finally go to this small art gallery that is on the same street. I kept passing by it almost every day and telling myself that I should go in one day. Small art gallery? I couldn’t have been more wrong! What I saw everyday was just two small rooms. Turns out it was a lot more than that, especially the stairs that take you to a very large space filled with art …amazed me. I spent 45 minutes (!) inside and that was just me trying to take a quick glance around. There were paintings, sculptures and a lot more! A variety of techniques were used which made it very interesting and surprising at times. I am definitely going back –with my sketchbook– soon. I start walking again, to my next destination. This is one of my favorite moments. With the music from your earphones and the soothing rain, you can –again- feel like you are in a movie! This time you are the main character (Not like it was with the carriage and horses above where you would probably just be a peasant on the streets.) This time you could even be a famous singer, shooting a new video! 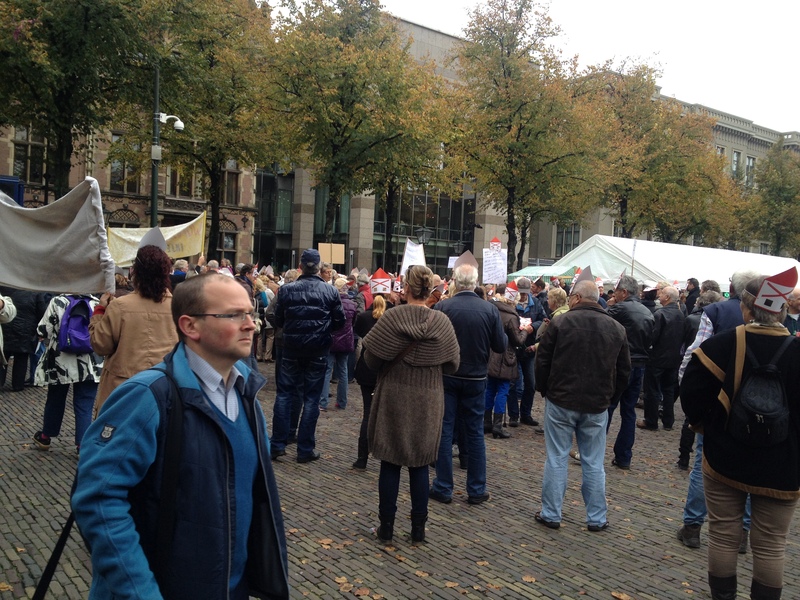 As I was passing through Het Plein I recognized a crowd and slowed down. There was a big white tent with tables, chairs and cameras inside and many stands outside the tent. Being a curious person I approached a woman behind a stand to ask her what was going on. She told me that it was National Food Day and the plans for the coming year regarding efficiency and sustainability in food production and consumption were being discussed in the tent. She also told me a few things about the stands outside, for example in one stand volunteers were cooking a meal from yesterday’s leftovers to draw attention to food going to waste and how this can be avoided. This event wasn’t the only thing happening on the Plein, there was also a protest at the other corner. At first I assumed this was somehow related to the event happening there but they were wearing house-shaped masks with crosses over them. One of the great things about being in The Hague is that there are a lot of peaceful demonstrations and as someone from Istanbul and a supporter of the Gezi Park Protests I like love them! I am finally at my next and last destination: Coffee Company! Back at home I would usually go to a Starbucks which was in walking distance from where I lived. I would know the baristas and even the other people who were regulars like me. However here in The Hague there is only one Starbucks. At first this came as a shock to me but since then I’ve been going around, trying new coffee places and I am happy to say that I’ve found a couple of nice ones, Coffee Company being my favorite. I love their coffee, playlist and the people. The coffee here is more expensive when compared to my hometown, exchange rates and the fact that I’m on a student budget isn’t making it any easier. But sometimes I do treat myself to a couple of nice hours in a coffee place and it’s definitely worth it. Alone or with friends, studying or writing, time spent over coffee is always time well spent. In a nutshell, this city is full of surprises and you can’t always know what’s waiting for you at the next corner but there is a chance that it will be something good. With the current Sinterklaas season, there is a chance that it might be a Zwarte Piet waiting for you and many others at a corner. 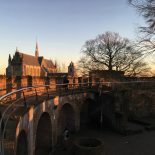 This entry was posted on November 17, 2013 by admin@theleidener in Ecesu, Study and tagged coffee company, day, Ecesu Erol, events, Het Plein, protests.